Best Selling Author Kenneth Eade, who has been compared by critics of his work to John Grisham, David Baldacci and Tom Clancy, is an international business lawyer, based in Los Angeles, California. 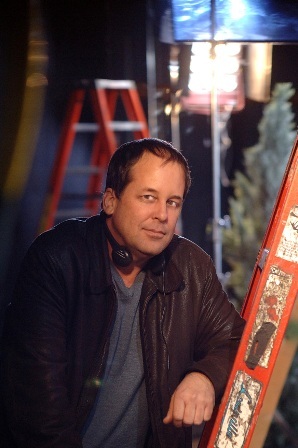 His first novel, An Involuntary Spy has been critically acclaimed, nominated for a 2014 Rone Award, and has also become a number one best seller in three categories. His second novel, Predatory Kill, Book 1 on the Brent Marks Legal Thriller Series, was launched in May 2014 and has hit the top ten in four bestseller categories. 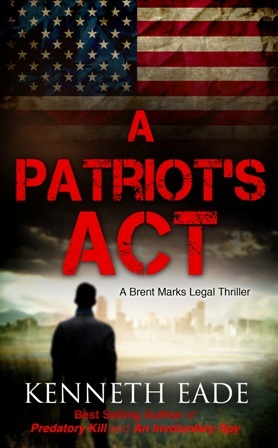 The second book in the legal thriller series, A Patriot’s Act, hit the pulp best seller list a month before its October 7, 2014 launch. Visit him here. NAW- Tell us about your book, A Patriot’s Act. How did you get the idea for it? What is it about? In 2004, Brandon Mayfield, an American lawyer was arrested on the basis of evidence concocted by the FBI and CIA, based on his fingerprints, which showed a possible match to the Madrid train bombings. He was arrested at his home in Oregon, held, without charge, for two weeks, and his home was searched without a warrant, under authority of the Patriot Act, which has virtually thrown the Fourth Amendment out the window. In 2006, two private American citizens working for private security contractors in Iraq, were arrested, tortured and held indefinitely in a U.S. military prison in Iraq; one for six weeks and one for three months. Since the U.S. government takes the position that anyone who is arrested on suspicion of terrorism outside the United States, and particularly in an area of conflict, is not entitled to any due process, I thought it would be interesting to follow the case of a naturalized American citizen who is arrested while visiting his brother in Iraq, thrown into Guantanamo Bay Detention Camp and subjected to torture to confess information that he did not have. I wrote it as a prequel to Predatory Kill, because it occurred in a time prior to PK and my fans told me that they liked the interaction between Brent and his investigator, Rick Penn, so I brought Rick back for this novel. It is a story of corruption and an imbalance of power. The indefinite detention and torture of those suspected of terrorism in Guantanamo Bay and the USA Patriot Act are two of the most shameful events of our time. NAW- Tell us about the character of Brent Marks. How did you develop the character? Brent Marks is a lawyer who has paid his dues, working his way up in private practice to the point that he can take on important cases; the kind that may make a difference in society. Being a lawyer myself with many years of experience, the character was easy to conceive of and give depth to. NAW- A Patriot’s Act is told from many viewpoints which works pretty well for the novel. How difficult was it using this technique for telling the story? I always try to use a different technique in my novels, which are designed to convey an important message as well as to entertain. A trial is designed to get at the truth, but it is an imperfect exercise because people have different memories and perceptions, and they also lie. I used a technique in this novel to reveal the real truth to my audience as they listen to the testimony unfold in the courtroom. I’ve wanted to do it for years, but never actually sat down to do it. Then, after being inspired to bring the story of the demise of the bees to the public, I just sat down, compiled my research, and wrote my first book, “Bless the Bees.” After that, it seems I could not stop. This book took about three months to complete, without editing. The name for the title was, of course, inspired by the USA PATRIOT ACT, legislation rushed through Congress which decimates the first, fourth and fifth amendments to the Constitution. The creation of the military tribunals and putting them into practice by the Government violated the habeas corpus clause of the Constitution, and violated the first, fourth, fifth, sixth and eighth amendments to the Constitution. NAW- What can a novice reader expect from A Patriot’s Act? Action, drama, outrage and suspense will draw the reader in to experience the horrors of America’s abuse of one of its own citizens in the name of fighting terrorism. From the face of it, it is a realistic look at a serious subject, but most people are engrossed with the court room drama of this novel, and find hope and inspiration in its message. This has been an interesting and exciting, but also frustrating ride. I know that my novels have the potential to be blockbusting, best sellers and most of them would make terrific films. But I am coming from nowhere and, even though the world has been opened up to self-published authors, my stories have not yet been discovered by the movers and shakers of the publishing world who can make those successes happen. When they do happen, it will bring what I feel are very important and contemporary messages to my readers. I am happily married, living in southern France, which is a great home base for traveling the world, which is my passion. I like classic writers, like Steinbeck and Dickens, but my method of writing is more like that of Hemingway, who was quoted as saying, “I just sit at my typewriter and bleed.” I also like John Grisham. I’m reading “Gray Mountain” by John Grisham, another one of my favourite authors. I’ve started the third novel of the Brent Marks Legal Series, “HOA Wire,” a traditional courtroom “whodunit,” inspired by the abuses of homeowners by their Homeowner Associations (HOAs), but my most ambitious project will be a dystopian novel called 2055.